“The Brazilian-American Soundtrack,” released Friday, is a sprawling urban-jazz exploration through Rio. 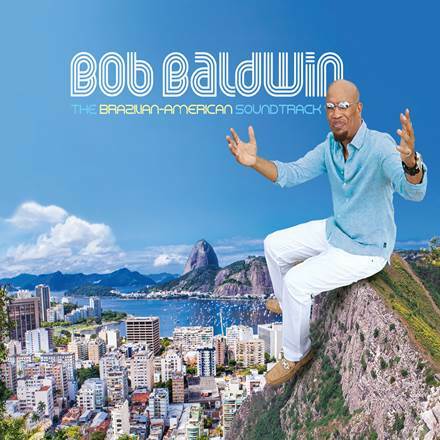 “The Brazilian-American Soundtrack” is Baldwin’s second foray into Brazil expanding on the territory he mined on his 2004 album, “Brazil Chill.” This time out, he purposely incorporated more American nuances into the mix. Supplementing his own compositions, he elected to honor a few of the iconic artists who influenced his artistic muse including Antonio Carlos Jobim (“Corcovado”), Ivan Lins (“Anjo De Mim,” “The Island” and “Love Dance”) and Djavan (“Eu Te Devoro”). Another formative inspiration was Maurice White, the late Earth, Wind & Fire creator and leader who Baldwin remembers with a heartfelt spoken word tribute that closes the album, “The Message,” and on two musical numbers, “Maurice (The Sound Of His Voice)” and “The Greatest Lover,” the latter of which was recorded in the spirit of White’s hall of fame band. Meticulously produced, performed, composed and arranged, most of the tracks on “The Brazilian-American Soundtrack” are tightly segued, maintaining a smooth flow and graceful transition from cut to cut through more than two hours of music. Baldwin’s winning team that bolsters his pliable piano gymnastics and effervescent keyboard finesse on “The Brazilian-American Soundtrack” consists of an international ensemble that includes noted Brazilian and Latin players Café Da Silva (percussion), Torcuato Mariano (guitar), Rafael Pereira (percussion) and Armando Marcal (percussion). Canadian trumpeter Gabriel Mark Hasselbach, veteran saxophonists Marion Meadows and Freddy V, and emerging flutist Ragan Whiteside add soulful horn solos while guitarists Marlon McClain and Phil Hamilton contribute compelling runs throughout the date that showcases a handful of charismatic vocalists: James “Crab” Robinson, Porter Carroll II, Gigi, Zoiea Ohizep as well as Baldwin himself. In fact, Baldwin demonstrates remarkable dexterity by singing lead and background as well as playing piano, Rhodes, keyboards, bass, drums, percussion, Moog bass, Melodica, strings and clave on the album. A Mount Vernon, New York native who has become a longtime resident of Atlanta, Baldwin debuted in 1988 with “I’ve Got A Long Way to Go” and his 22 albums – eight of which climbed into the Billboard Contemporary Jazz Top 20 – are jazz, R&B and gospel outings. Over the years, he’s worked as a producer, songwriter and performer alongside George Benson, Gerald Albright, Euge Groove, Will Downing, Phil Perry, Pieces of a Dream, Paul Taylor, Rick Braun, Kirk Whalum and Chuck Loeb. Since 2008, he has hosted the nationally syndicated radio program “The NewUrbanJazz Lounge,” which attracts nearly 500,000 listeners weekly. His City Sketches, Inc. is the umbrella entity that houses a production and event planning company, the radio network and NewUrbanJazz Hats. Baldwin is also the author of two books about the music industry, “You Better Ask Somebody” and “Staying On Top of Your Career in the ‘Friggin’ Music Business.” For more information, please visit www.BobBaldwin.com.